Brad May has willingly accepted a paternal role with the Grand Rapids Griffins. That says as much about his sense of humor as his age. May, 38, recently went shopping with teammate Riley Armstrong, 25. Armstrong purchased a computer. When an unwitting salesperson commented on how lucky Armstrong was to get such a nice bauble, Armstrong said his dad bought it for him and pointed to May. "He played it right up. It was fun," May said. "I said, 'Yeah, he's a spoiled brat.'" No one said the AHL was going to be a complete joyride for the aging wing, although May wakes up every day trying to treat it that way. May, a 19-year NHL veteran, was assigned to the Griffins for his first-ever AHL action after 1,041 games up top. In 40 games with the Red Wings this season, he had one assist. "There's obviously a lot of difficult days playing hockey. But it's how you react from those times that shape who you are," he said. "If I walked around with a chip on my shoulder, that could affect the way they look at you. I'm just one of the guys." Except that some of those guys were close to not being born yet when the Sabres took May in the first round of the 1990 draft. And that none of them are close to having two teenagers, as May is with a 14-year-old son and an 11-year-old daughter. May spends his family time counseling his children and then makes himself available for teammates who might be in need of the same. "I try not to be a blowhard. You can't just be spewing out a bunch of garbage," he said. "Either you have some good advice, or you don't. You see things all the time. But is it the right time or the right place (to say something)? These guys have been playing all year. It's not as if they are all green. They know exactly what it takes for their life to work." May has an idea what keeps him perky every day. He said his demotion is a lot easier to take with just a few weeks left in the regular season instead of a few months. By the time the Red Wings begin their playoff run, May figures he'll have shown he can help in that endeavor. "That's why I'm here. To win a Stanley Cup," he said. "It may seem a far way away. But it's not that far. My eyes are always on the ball. It's important to stay focused." Attainable goals -- Adirondack Phantoms defenseman Logan Stephenson kept his aims modest this season. "I came in with zero expectations," he said. From such humble beginnings has grown the Phantoms' most reliable defensive defenseman, a turn of events that's surprised the player as much as anyone else. Stephenson, 24, started his fourth year pro fresh off his entry-level deal with the Phoenix organization. He got a preview of the bumpy terrain ahead last season when he was traded twice, from San Antonio to Iowa and from Iowa to Rockford. "And none of them did I see coming," he said. "It made the season long, I'll tell you that. It made that season seem like a decade. Oh God, was it long." But not as long as the summer felt. Stephenson had very little on the table in the off-season and came to Phantoms camp on a tryout deal. "It was brand new territory for me," he said. "I was hoping to be able to land somewhere in the system. I knew I was going to have to prove myself. I didn't really ask too many questions. I kind of put my head down, go to work, and hope I have a job tomorrow." Stephenson earned an AHL deal with Adirondack, a perfect fit of a blue-collar defenseman and a small, new market. Stephenson comes from Outlook, Saskatchewan (pop: 1,936). His dad, Bob, a former NHLer, is the town's mayor and runs the Irrigation Centre Motel out of the family home. There is no room service at the place, unless you count Logan's mom whipping up a meal for tired travelers herself. That's the sort of small town background that makes Stephenson feel and play right at home in Glens Falls. "It's a community pride type of thing here," he said. "I've enjoyed every second of it. It's the same little feel (as Outlook). I love going to the diners, going to the hotspots. Anywhere you go, they recognize you. That stuff is awesome." Cheechoo begins again -- Jonathan Cheechoo's journey from Ottawa to Binghamton took a quick detour through St. Thomas. "There's obviously a lot of difficult days playing hockey. But it's how you react from those times that shape who you are. If I walked around with a chip on my shoulder, that could affect the way they look at you. I'm just one of the guys." That's where the veteran forward spent his Olympic break. He planned the vacation long ago, never envisioning that he'd be playing in any league but the NHL when it rolled around. But Ottawa sent him to the AHL on Feb. 13, with permission to take time off for a trip to balmier weather. "I just wanted to get away," Cheechoo said. After heating up his 29-year-old bones, Cheechoo now has to find a way to fire up his game. The slide down to the AHL is a remarkable pothole for a player who just four seasons ago was one of the top snipers in the NHL. But since scoring 56 goals for San Jose in 2005-06, his goals total declined to 37, 23 and 12 the past three seasons. He had just five in 61 contests for Ottawa this year. "That's the way it goes sometimes. I just have to work through that. When you're playing, you have to produce," Cheechoo said. "There's nothing that can explain the five goals this year. The game is very numbers driven. They want production from you. I know that. Hopefully, I can turn it around." He's started that process with four goals in his first 10 games with Binghamton. "I think it's been pretty good so far. I've gotten a few goals," Cheechoo said. "My confidence is coming back. I don't want to say it was gone. But it was pretty low." Around the AHL -- Hamilton defenseman Andre Benoit recorded his 86th point as a Bulldog in a contest against Chicago on March 5, making him the franchise's all-time leader in points by a defenseman. In that same game, Hamilton's P.K. Subban’s posted his 45th point of the season, setting a team single-season mark for points by a defenseman. ... Hamilton matched a franchise with its ninth-consecutive victory by beating Toronto 3-2 on March 9. 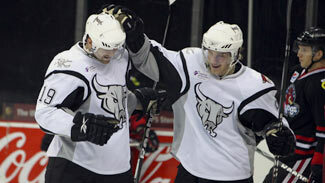 ... Washington has signed Hershey center Keith Aucoin to a new two-year, two-way NHL contract through the 2011-12 season. Aucoin, 31, currently leads the AHL with 84 points. ... Providence was the last undefeated AHL team in shootouts this season (5-0) before losing to Lowell in that drill on March 7. ... Jerome Samson has become the first River Rat to score 30 goals in a season since Pierre Dagenais pulled off the trick in 2000-01. ... Hershey has not lost back-to-back games since Nov. 21-25, and has not dropped consecutive decisions in regulation since Oct. 23-24. The Bears' 24-game home points streak (23-0-0-1) has tied a league record, previously accomplished by the Springfield Falcons spanning the 1996-97 and 1997-98 seasons. ... Norfolk rookie Dana Tyrell has 15 points (4-11-15) in his last 13 games after totaling 11 points (2-9-11) in his first 47 games of the season. ... Syracuse's overtime win against Binghamton on March 7 was the Crunch’s first extra-period victory since Oct. 24, 2008, also vs. the Senators. ... Binghamton was called for zero penalty minutes in that March 7 game. ... With three wins to begin the month, Syracuse is 23-5-1-1 in March since the 2007-08 season. ... Jon Gleed's first goal in 108 career AHL games gave Bridgeport a 2-1 overtime win at Manchester on March 7. ... Peoria’s Cam Paddock had gone his first 244 career AHL games without a two-goal effort before scoring twice in a 4-2 win at Milwaukee on March 7.